See below for current artist and job opportunities with CCA. The Open Stage invites your participation. Throughout the run of Celebration Factory we will be taking bookings for its use. Do you have a music or spoken word event, stand up act, discussion, critique or public meeting you’d like to organise? CCA has an online shop stocking our range of artists’ editions, publications, posters and more. We are planning to expand our selection to include limited runs of guest publications from Northern Ireland and beyond. By featuring new and diverse work in CCA’s online shop, we will be able to bring our audiences’ attention to spectacular work using the book format by artists and others. We are looking for great publications to feature for limited two-month runs, on a profit-share basis. These may include artist publications, exhibition catalogues, critical writing and more. 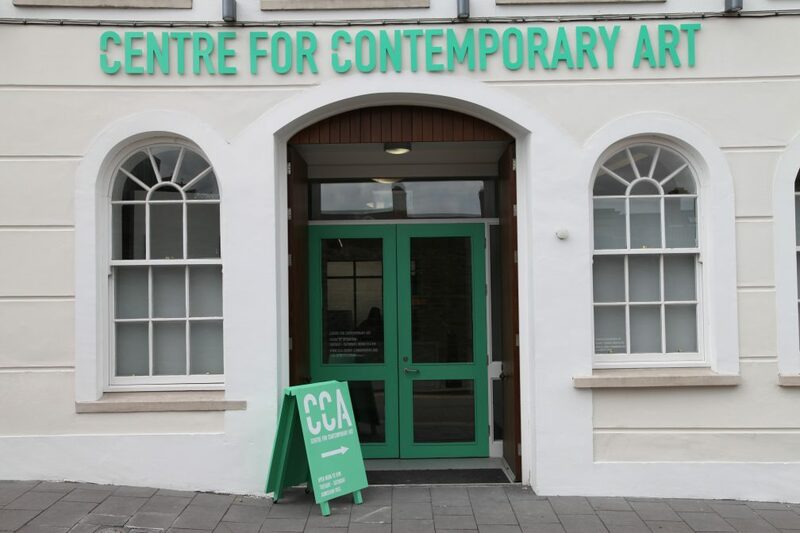 CCA Supports is a programme of activity to support artists to develop their practice. This is a multi-strand project with different elements being launched across 2019. CCA’s Workshop hosts CCA events, meetings and workshops throughout the year. CCA is designating four days per month to artists, curators, designers and others to use the Workshop space for free during our regular opening hours of Tuesday–Saturday 12–6pm. The space can be used as a temporary studio, performance space, for meetings or more. The Workshop has tables, chairs, sofa, tea and coffee making facilities and a sink (note: there is no trap on the sink so make sure any hazardous chemicals such as turps are disposed of safely). CCA works with artists to realise new artworks and to create different environments in the gallery spaces. We are looking to widen our pool of technicians to call upon, including people with skills in AV and multi-media, carpentry, painting and decorating and other technical specialisms. CCA is looking for graphic designers to call upon over the coming years for various pieces of design work that may range from artist publications to stationery,GIFs or web design.